Passionfruit (a.k.a. Passiflora edulis) is a sweet and seedy tropical fruit. It is slightly oval in shape, with either yellow or dark purple external skin when fully mature. The yellow passionfruit grows larger than the purple, but the pulp of the purple variety has a more intense smell and flavor, it is less acidic and yields more juice. Once ripe, passionfruit tastes sweet. The skin is thick like pomegranate’s, and once broken, inside the slimy yellow flesh wraps individual seeds. Use a spoon to scoop them out and eat. The seeds are edible and crunchy, which is what makes this fruit special. Fresh passionfruit is high in B vitamins, vitamins A and C, calcium, cooper, fiber, folate, iron, magnesium, niacin, phosphorus, potassium and protein. It also contains high levels of antioxidants with about 13 carotenoids, such as zeta, beta and alpha-carotene, b-cryptoxanthin, and lycopene, just to name a few. Anti-cancer: A recent study shows that extracts from common passionfruit juice killed off 50% of leukemia cells at such low concentrations that it’s an ideal candidate for development as an anti-cancer drug. Passionfruit is surprisingly rich in several known phytonutrients that act as anti-cancer agents, such as apigenin, luteolin, caffeic acid and betacarotene. The seeds contain passifloric acid and amygdalin (a.k.a. vitamin B17) that fight cancer. Blood pressure: Passionfruit is effective at defending the body from high blood pressure because it is high in potassium and has very little sodium. Potassium balances electrolytes and controls muscle function, such as the heart muscles that make the heart beat. It is also in charge of releasing calcium into the blood stream which causes artery blockage if it is released too quickly. Cancer: Cancer is formed by free radicals that grow and damage cells. Free radicals can be cleaned up by regularly consuming antioxidants before they have time to damage the healthy cells. Passionfruit is high in vitamin A and C, which are strong antioxidants. These vitamins neutralize the free radicals and protect our bodies from cancer. Cardiovascular health: Passionfruit is rich in dietary fiber that reduces cholesterol levels in the blood. Cholesterol is one of the leading enemies of the heart; it can block arteries and create variations in blood pressure causing increased stress on the heart. The high fiber increases HDL, the good cholesterol and reduces LDL, the bad cholesterol. Potassium protects the heart from an irregular heart beat and controls the contraction and expansion of heart muscles. The high antioxidant content keeps the arteries from hardening, and cleans up plaques formation from inside. Colon cleanser: The soluble fiber in passionfruit cleans toxins that build up in the colon by easing healthy regular bowel movements. The antioxidants also help clean the colon, the toxins that build up in the intestines and gastrointestinal tract. Hemoglobin increase: Our blood is red because of a pigment called hemoglobin which transports blood to all of our body parts. Anemia is a condition caused by a deficiency of hemoglobin, it is not serious but if left untreated it can lead to complications. Low hemoglobin level can cause symptoms such as persistent tiredness, breathlessness, drowsiness, dizziness and blackouts. Mood enhancer: There are medicinal alkaloids and phytonutrients in passionfruit that are known to have a slight sedative property. 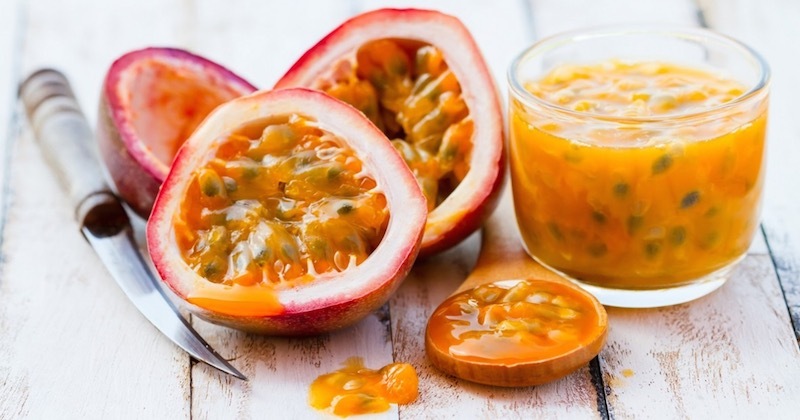 Eating passionfruit can relax the nervous system and encourage restful sleep. It is an excellent mood enhancer and doctors have started using natural supplements containing passionfruit to treat depression, anxiety and insomnia. Vision health: Passionfruit contains high amounts of antioxidants like vitamin A, C and flavonoids. These nutrients can help protect your eyes from free radicals that cause damage. They also care for the mucous membranes that guard the cornea of the eye; the beta carotene content also has positive effects on eyes and vision health. Choose passionfruit with skin that is a little wrinkled, which means that it is ripe. The unripe fruit may be a little sour but once ripened, it is sweet. Passionfruit can be eaten and juiced; it is often mixed into other fruit juices to improve the aroma. The fruit can be left at room temperature until ripe and then refrigerated. To freeze passionfruit, scoop out flesh and place into ice cube trays, once frozen, transfer cubes to a freezer bag. Passionfruit has sedative effects and may cause intervention with other drugs. If you are taking medication for depression or anxiety it is important to discuss with your doctor about consuming this fruit. Excessive alcohol use should be avoided with passionfruit as well because of similar reasons.